I have been a bit fired up recently while making all the Six Trousers and Five Trousers I have been doing recently. They all started out as practice runs before making the Ten Suit Trousers, but I have ended up with half a wardrobe of some of the earlier Doctors. 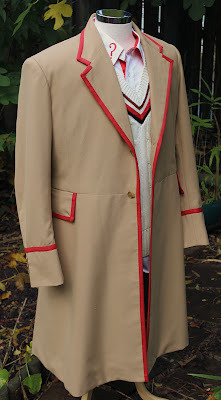 So I have decided to have a go at making a Five Coat to go with my trousers. After all the work I have done on the Ten Coat, making a Five Coat should be a lot easier as there is much less to it. The only part I am daunted about before hand is the red piping as that will undoubtably have to be sewn by hand, but I am sure once I get to it and start knuckling down, it won’t be as bad as I thought. 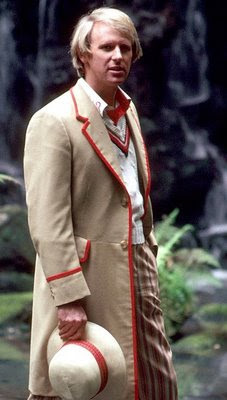 Looking back, I have always wanted a Five Coat, right from when Peter Davison was playing the part in 1982. I suppose it was the first item of cosplay I ever wanted, though at the time I’m sure it wasn’t called cosplay. I was quite taken with the simple style of the coat and I tried to find something similar without success. I went several times to the King’s Road in London where there used to be a number of vintage clothing shops to try and track down something even of the same style. I wasn’t expecting to find the exact same coat, but maybe something that some red piping could be sewn onto. Each time I came home a disappointed teenager and was very glum. My mother came up with a plan: her one claim to fame was that she had been at school with someone who had later become a famous tailor and maybe we could ask him if he could make one for me. The tailor concerned had an amazing career in which he dressed The Beatles and The Rolling Stones - he was Tommy Nutter (see left), a name you may not know, but he was a innovative and respected Saville Row tailor. We hoped to call in a favour. After several attempts she managed to finally get him on the phone and although he remembered who she was and chatted over old times, the best he could offer was to do it for around £1,000 - which in 1982 was an absolute fortune - so sadly it never ever happened. 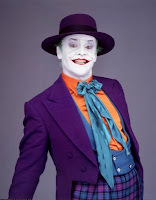 Tommy later went on to design the costume for Jack Nicholson for Batman (see above, click to enlarge, and take time to see some of the great details, such as the playing card buttons on the waistcoat and use of fabrics). The first thing to sort out is the pattern. A friend has suggested to me a couple of patterns for frock coats that could easily be used with little revision. The first is from Laughing Moon, who did the pattern I followed when I was making my Six Trousers. Their California Pants pattern was easy to follow, and I learnt a lot from making them. 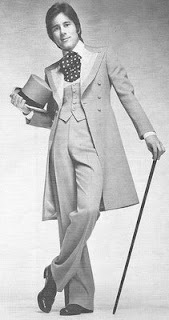 Their Frock Coat, however, is a little more fancy than I need, with a double breasted option with silk-faced lapels (see left). Another suggestion was a pattern from Buckaroo Bobbins, who also have a Frock Coat pattern. This is just a single breasted option, and has all the features I need including the horizontal flapped side pockets and (as I was to find later) the detail surrounding the lower back (see right). Their website is really basic, and looks like it has not been updated since the inception of the internet. 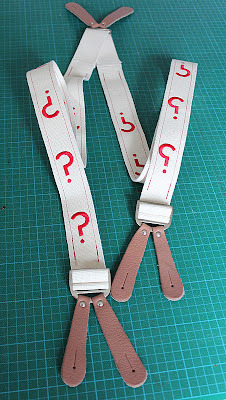 I found an email address hidden away at the foot of one of the deeper pages and enquired about obtaining the pattern. I got a very quick and polite reply giving me details of how to pay and international shipping costs. I paid and within a week the pattern duly arrived. First thing I need to do is copy the size of pattern I will need and create my own paper version to cut from. I do this by tracing through the Buckaroo pattern to my paper below using a tracing wheel, which puts a line of fine puncture marks, not enough to cut the paper, but such that you can see the line to cut. This was I preserve the original pattern in case I need to go back and use one of the larger or smaller sizes. The pattern is a little tricky to work with, as it is an amateur effort (but published with a passion) and the paper they have used is on several occasions smaller than the pieces I need to cut. They have therefore sliced larger parts in half and left the user to paste them back together to make whole pieces. This includes the back and tail (see above); upper and lower sleeves; and worst of all the skirt, which requires four pieces to be joined together to make it whole (see right). Having said all this, don’t let it put you off, the joins are easy to follow as long as you are careful, and I soon had the pattern transcribed as needed. Next I plan to do my usual calico test. This will help check fit; make sure the overall cut is right; and most of all give me some hands-on experience of the pattern before cutting the final fabric and making any avoidable mistakes. I will show you this calico test being made next time. The images of the pattern are copyright © and shown with kind permission of Buckaroo Bobbins.